Some vegetables work so well with Indian cuisine, it is hard to imagine a delicious meal in a fine Indian restaurant without them. Take cauliflower, for example. Known as gobi in India, the cloudlike white brassica seems designed to absorb spicy flavours from a sauce. The delicate and subtle flavour of gobi combined with its crisp texture provides the perfect vehicle for Indian flavours. Many Indian states grow huge quantities of cauliflower, particularly during the winter. The vegetable is used in pickles, soups, curries and fried snacks. In the UK, cauliflower is seen as a fairly humble specimen, best smothered in cheese or gravy; in numerous Indian dishes it is the central focus. Eating fine Indian dishes containing cauliflower is not just a good idea for your taste buds; it could also benefit your health. Cauliflower is known to be a good source of vitamins A, B and C, as well as other minerals. It is also a source of protein. 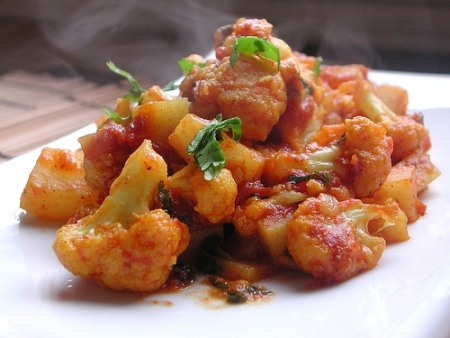 Let’s look at some dishes containing cauliflower that you might find in a fine Indian restaurant. Cauliflower florets are softened in boiling water than drained and sautéed with an appealing mix of ginger, garlic, onion, tomato and cashew nuts. As the sauce thickens around the vegetable, further spices are added; coriander, cumin, chillies, garam masala and turmeric to lend a brilliant golden colour. A little cream is added to improve texture, before the dish is served with freshly steamed rice and hot roti. If you’re lucky enough to visit an Indian restaurant with a wide selection of pickles, be sure to try some with cauliflower. This carrot and cauliflower pickle is wonderfully sour and spicy. Cauliflower is mixed with carrot and turnip batons then combined with a paste made from sugar, vinegar, garlic, ginger and onion. Spices such as garam masala, chilli powder and mustard seeds are added then the pickle is bottled and left in the sun to develop its excellent flavours. Simple, delicious and amazingly moreish, these bitesize fritters will make you see cauliflower in a whole new light. Boiled cauliflower florets are drained then marinated in chilli powder, turmeric, ginger, garlic and garam masala. After a few hours, the florets are dipped into a batter made from chickpea flour, asafoetida, baking powder and salt then plunged into hot oil. The batter puffs up to form a crispy coating around the spice-infused cauliflower. Indians love to eat these spicy snacks with chopped coriander and green chutney made with lime, ginger, chillies and coriander. This popular dish puts together potato and cauliflower for some wonderful texture contrasts. Flavoured with cloves, cardamom, mace and cinnamon, the sauce is given extra substance with cashew nut paste, onion and tomatoes. Chillies, turmeric, coriander and cream are added to make the sauce a glowing light brown, then cooked cauliflower and potato are added to soak up the spice flavours. This dish is a real treat when served simply with a freshly made chapatti and a selection of authentic Indian pickles.